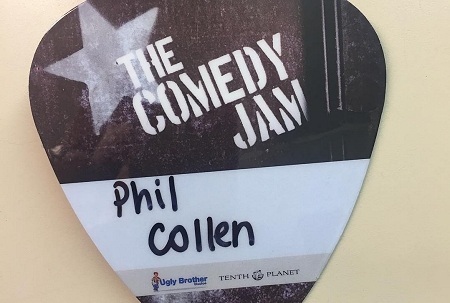 Def Leppard guitarist Phil Collen will appear on a new show called The Comedy Jam this April. 'The Comedy Jam' show premieres on 22nd March on Comedy Central TV in the USA. The show - "features stand-up comedians performing in front of a live audience while they share memorable moments from their lives and perform an iconic song that related to that experience". Phil's episode airs on Wednesday 19th April at 10:00 p.m. ET/PT. Phil taped his appearance on 11th January at Ugly Brother Studios in Culver City, California and posted a photo from backstage along with a quote. He will be jamming on the show with American actress Taryn Manning who starred in the shows 'Hawaii Five-O' and 'Orange Is The New Black'. Together they will perform 'Pour Some Sugar On Me'. Also appearing on the same episode are Bert Kreischer, Scott Stapp with Ron 'Bumblefoot' Thal and Hal Sparks with Sebastian Bach. As mentioned the 'Live From Detroit' DVD will be featured in a one hour TV special on 2nd April by AXS TV. Note - Comedy Central's online videos are unavailable outside of the USA. "Jamming with orange is the new black's Taryn Manning at comedy central's comedy jam. This'll air in April." Bert Kreischer, Scott Stapp and Ron 'Bumblefoot' Thal performing 'Higher' by Creed. Taryn Manning and Phil Collen performing 'Pour Some Sugar on Me' by Def Leppard. Hal Sparks and Sebastian Bach performing 'You Shook Me All Night Long' by AC/DC. Jamming with orange is the new black's Taryn Manning at comedy central's comedy jam. This'll air in April.